While driving down state road 23 you may have seen a yard full of odds and ends. 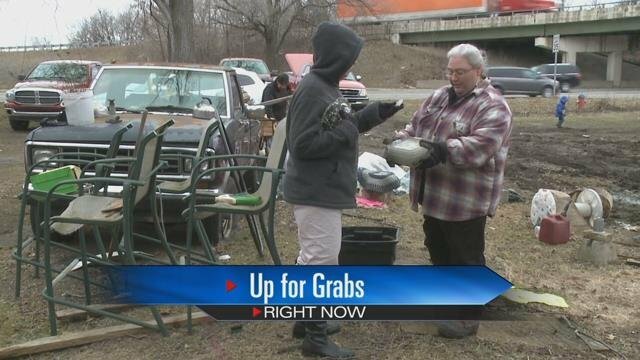 On Monday one South Bend woman took to social media to invite the community to what she calls a ‘one man’s trash is another man’s treasure’ event. The items on the property belong to Shelley Geans’ father and the giveaway is in honor of him. He lost a battle to cancer in December. On Tuesday his home and items will be cleared from the property. Geans wants to give the community one last chance to make use of some of her father's items. “He was a giver – my dad gave a lot so he would love nothing more than to see all this stuff being given away,” says Shelley Geans. An hour after posting a video invite to Facebook dozens of people were parked in her father’s former front yard. “He was diagnosed with cancer about four years ago and passed away December 7th of last year,” says Geans. For over two months, Geans wondered what she was going to do with all the items her dad had collected over the decades. “He was self-employed and he would do a lot of house clean outs and everything had a use to him,” says Geans. Shelley is hoping you can find use for anything from dishes to hubcaps to furniture. Even a tractor was up for grabs. “My dad would be thrilled to death seeing all these people out here picking through his stuff,” says Geans. Shelley is hoping her generosity and resourcefulness is making her father proud. “He believed in using his resources wisely he taught me how to use my resources wisely so I thought well this is the best thing I can come up with give it away,” says Geans.